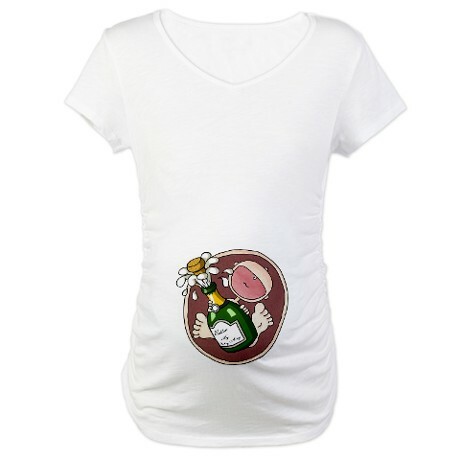 Are you looking for some funny maternity shirts to get you through the long months of pregnancy? Or a great maternity shirt to give to a friend for a baby shower gift? Or maybe just some funny maternity tees for your wife who has been having some long sleepless nights due to her pregnancy. These funny maternity shirts let you know just what your baby is actually doing in there while you are waiting for the baby to arrive. 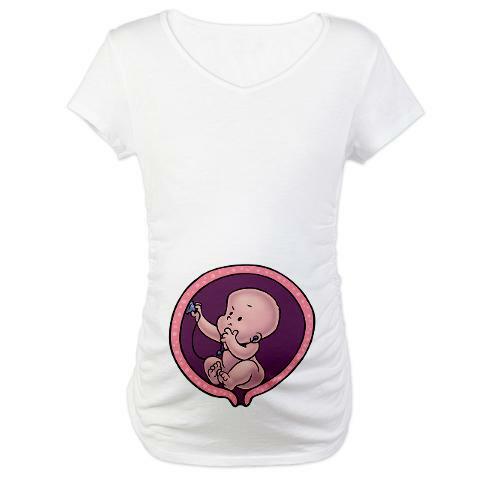 Each maternity tee is lovingly created using custom designs of a cartoon baby in the womb. Baby is pretty busy in there as you can see that he/she is rocking it up, being an intern, and a lil' biker as well. There are several terrific designs and they are very funny, so that you and your mom-to-be will be chuckling over the images on these funny maternity tees. Click through the design choices. All the funny shirts come in both black and white, and they are made of very washable cotton, so that you can wear them over and over. Lots of laughs to be had with these maternity tops. To purchase the Intern Inside Maternity Shirt pictured, click here. What makes the baby in womb design so funny? I think for the nine months (or ten) leading up to birth, mothers-to-be are constantly thinking about the child growing inside. What exactly are they doing in there when we feel them kicking and moving around? This page was originally posted on Squidoo in 2008 and since that time it has evolved, grown and now, has moved to Hubpages. 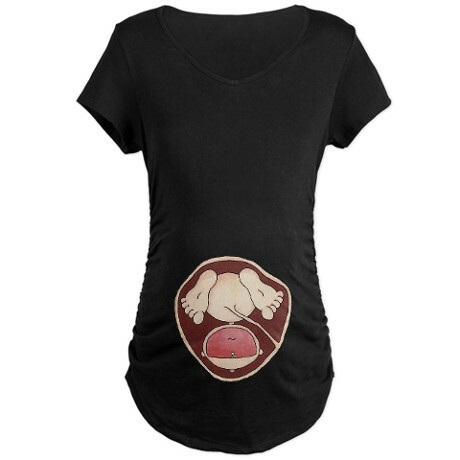 I can no longer post a link to each and every funny maternity shirt like I used to. However, if you click this link, you can search for the shirts by name. Here is a list of the hilarious shirts on this page. 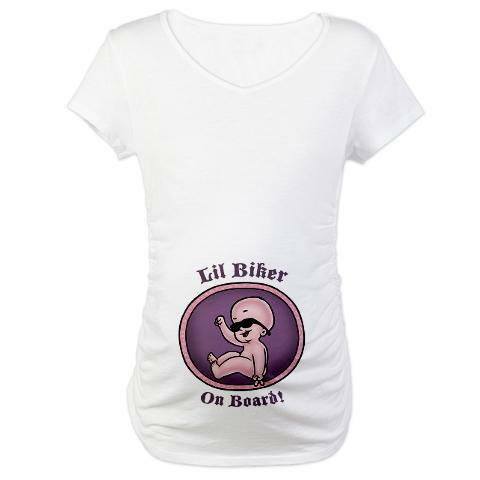 Lil' Biker on Board Maternity Shirt--This Lil' Biker maternity tee will surely grab attention and make people stare. Fun, cute and friendly cartoon baby in the womb. If you are a biker or know a biker who is pregnant, this shirt is so much fun. Great gift for a baby shower. 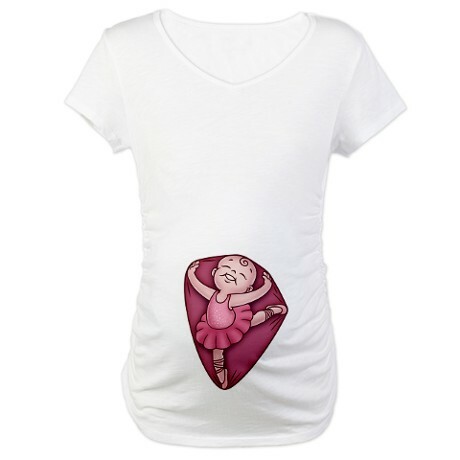 Peacenik Maternity Shirt--Cute cartoon baby in the womb, holding a protest sign with the peace symbol. Cool, affordable maternity top, easy to wash and wear. Bring out your inner hippie and tie-dye this shirt for even more hippie fun. This is a great gift for a pregnant mom who is creative, artsy or just is diehard hippie. Twinjas Maternity Shirt--Cartoon twins, in the womb, kicking and punching ninja-style. This top is just a precursor of life with twins. I bet you can feel their ninja practice inside your belly every day. Number 1 Seeded Maternity Shirt--Cute Baby in the womb, poised for a tennis volley, with: "Number 1 Seeded!" Funny maternity tops, mugs, gifts, and other cute maternity items with this funny design in black or white. Water Breaker Maternity Shirt--The baby in this cartoon is trying to stop the water from running out of his or her bath inside the womb. The little yellow rubber duck and the worried look on his or her face make this novelty maternity shirt really funny. 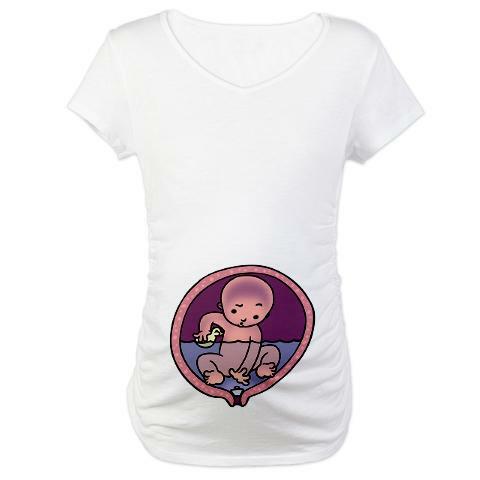 Funny Womb Potato Maternity Tee--"I'll be out later," says Womb Potato. Cartoon baby in the womb watching a music video podcast. Buns in the Oven Maternity Shirt--This will make friends laugh out loud. Belly Dancer Maternity Shirt--I have a few friends who have claimed that their babies were belly dancing in their bellies. This shirt is for them. Love Child Maternity Shirt--Are you a closet hippie? 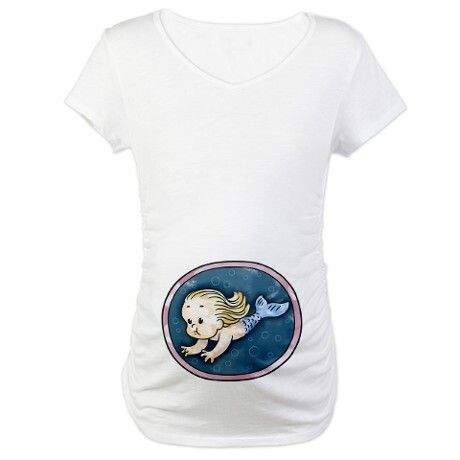 This Love Child Maternity Tee is funny and cute, and very, very hip. 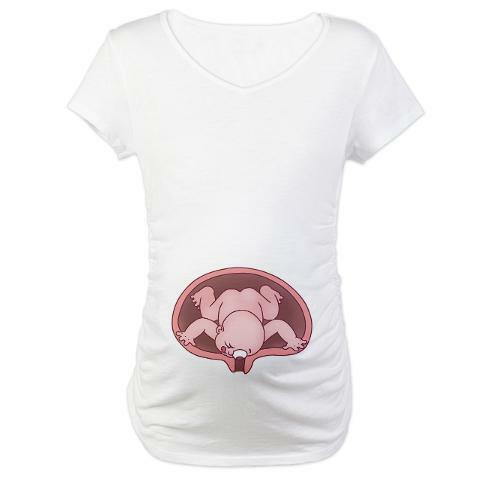 Cwoded Womb Maternity Shirt--It's getting a little squished in there, time to come out! 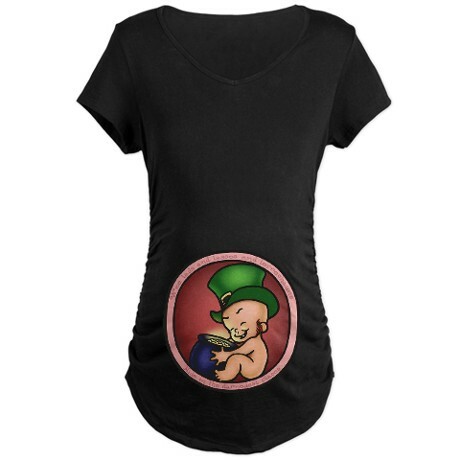 Irish Hiding Places Maternity Shirt--Great shirt for St. Patrick's Day, this maternity tee shows you some really suspicious doings behind that big pregnant belly. Pirate Hook Maternity Shirt--If for nothing else but laughs, this shirt will get them rolling, but it would also be great to wear on Talk like a Pirate Day. Mermaid Maternity Shirt--Of all of the new additions to funny maternity shirts on this list, this Mermaid Maternity Shirt is my personal favorite. I love the image of the mermaid swimming inside the pregnant womb. This is great all year and will get a lot of people laughing. 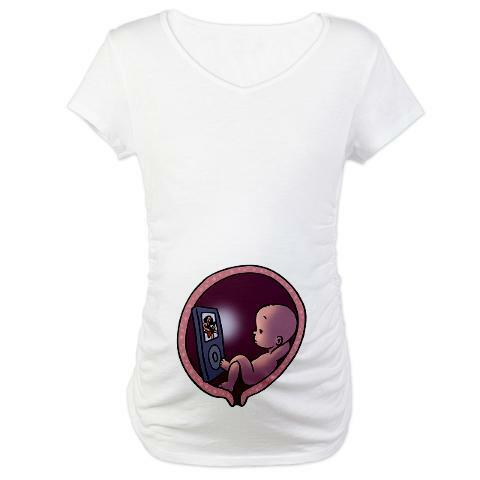 Looking for more designs of funny maternity shirts? If you still want to look for more maternity shirts, check out Funny Maternity Shirts on Holly Jolly Holidays which originated from this page. We are expanding our selection for more occasions and from more vendors. You can also search for matching pajama pants on CafePress which is a newer offering, as well as long sleeve and sleeveless versions of these classic designs. What shirt did you like best? Cute shirts! Thanks for sharing! Love your lens! I like the Funny Crowded one best! I'll be honest, the twinjas kind of freaked me out! My favorite is the little guy watching tv in the womb. Really funny. Womb potato. Even the name is funny. These are great. My favourite? The one on the computer. Pretty funny and cute shirts, nice collection. Some of these are hysterical! Thanks for sharing. Great gift idea for a guy who might not otherwise know just what to get! 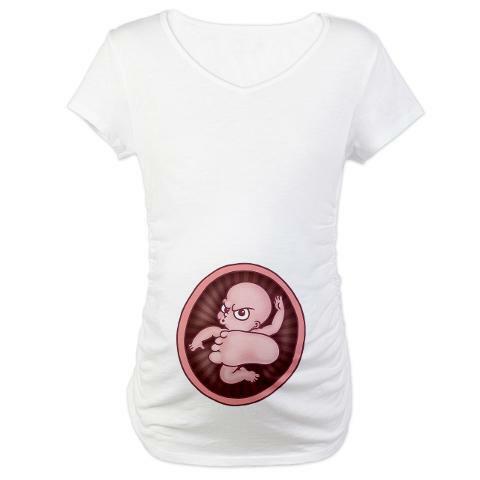 What a fun way to dress and enjoy your pregnancy with these t-shirts. These shirts are awesome. Wish there had been some full clothes to wear back in my baby days!! Unfortunately, I was in the generation when maternity clothes were just plain ugly. I wish I had seen this lens last August when my cousin was looking for a funny T shirt for her PG friend...really cute shirts! these were funny indeed, however I find it hard for a pregnant woman wanting to wear these, would need a good sense of humor, enjoyed my visit here tonight. How funny! I think I like the pirate baby best, matey. Awesome Lens. I can't stop laughing. These Shirts are cool. The fact that on some of these the womb has a cervix grosses me out for some reason. I can't put my finger on it. It's just a bit TOO realistic. Spreading *Cupid Kisses* on Valentine's Day! These are really cool, funny shirts! These are so funny. Really clever maternity shirts. Thanks for the laugh. Came back with a Squid Angel blessing and these made me laugh again! Thanks! Great shirts, I love the womb potato one the best, though! These are hilarious! We have 4 kids - the youngest is 8 - so I'm hoping that the next time we have to think about buying this kind of stuff is when we have...dare I say it...grandkids! But, I think we are a few years from that, at the moment. I liked a bunch of them, but I think my favorites were two in the Amazon modules, Bun in the Oven and I Only Wanted a Backrub. Thanks for a fun lens! Funny stuff! Sometimes you've just got to smile -- or make others smile. A fashion statement and a laugh at the same time! Thanks for this page! @anonymous: Is Grammy okay? Seriously, though, congrats and wow! A great collection of mommy shirts. Definitely lensrolled to my Cute Kids Videos. These are a cool collection of shirts. Squid Angel blessed, nice work! What novel maternity shirts! Great collection. Love these shirts! Wish I had these when I was pregnant. Lucky you!! 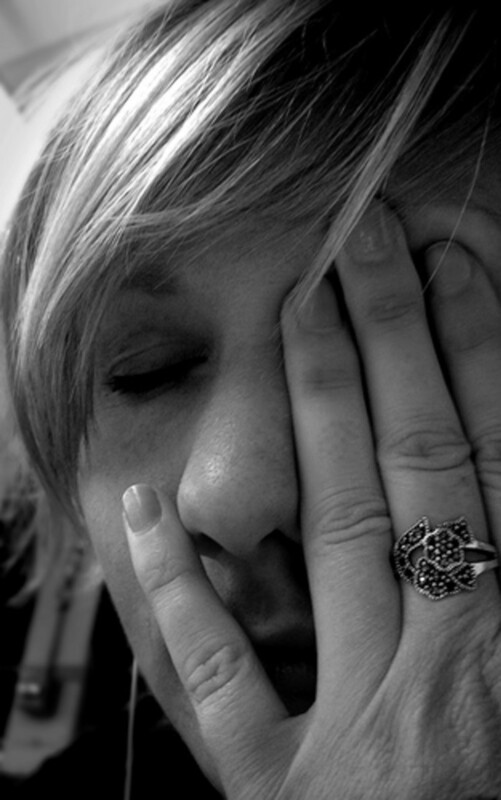 You're this weeks featured Lens on Parenting on Squidoo. Go ahead, take a peek! 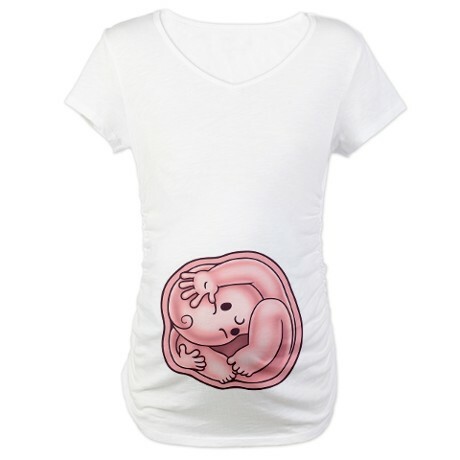 Love the Baby Kick and Womb Potato t-shirts, they are great! Welcome to Best. T-Shirts. Ever!